Look, microwave mug cakes aren’t a health food. They’re made of white flour and refined white sugar, so it’s not a good idea to make a steady diet of them. That said, if you do want to indulge, it’s probably far better to bake a microwave mug cake than it would be to bake an entire pan of brownies or muffins. A microwave mug cake offers only a single-serving and, once you’re done indulging, it’s gone. Anything else that you might bake offers leftovers. You know what you do with leftovers — you give them away (which provides others with more temptation than they probably need) or you eat them yourself. Besides the fact that you probably don’t want a few days’ worth of leftovers every time you want to treat yourself to something sweet, microwave mug cakes boast another selling point. you always eat them when they’re freshly-baked. Now if you know something that can beat a still-warm Microwave Mug Cake for freshness — and it’s built-in portion control feature — please let me know. Until then, I’m treating myself to Microwave Mug Cakes, and I’m leaving the full-sized cakes for truly special occasions — like Thanksgiving get-togethers! This entry was posted on Sunday, October 4th, 2009 at 9:56 am	and is filed under microwave mug cakes. You can follow any responses to this entry through the RSS 2.0 feed. You can leave a response, or trackback from your own site. Funny you mentioned having a whole cake for Thanksgiving. Because we all like different things we always end up with lots of whole cakes for Thanksgiving. This year will be different. 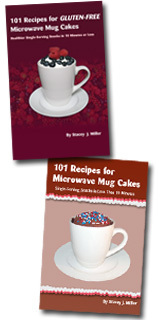 Using your book each family member can have their own microwave cake, no more fighting. Thanks Stacey, what a great idea. We tried 2 of your mug cakes last weekend and gobbled them up!!! They truly are delicious. I’m going to buy a bunch of these books and send them to all my friends. Thanks for your comments on my 5 minute chocolate mug cake posting. I had no idea there was a book out there on mug cakes – how wonderful. I’ll certainly look you up on Amazon and add your book to my wish list. I agree, speaking from experience, one mug cake is much safer than a whole cake! your cakes may be made with refined sugar and white flour but i use splenda and brown/whole wheat flour in all my baking. any harm in making those slight changes stacey? My testers tell me that various types of flour work fine and, while I haven’t tried sugar substitutes (yet), I assume that they’ll work in MMCs if you follow the directions provided by the companies that make them. In other words, if equal amounts of splenda can be used to replace sugar, then I’d say go for it. If you have to follow some other formula (say, use half as much splenda as you would sugar) for other recipes, then follow that formula, and please let me now how it turns out!